Having grown up as a Cold War ‘army brat’, spending most of my childhood in northern West Germany, my visit to Kaliningrad on the Baltic Sea last week felt a touch surreal. It was as if we were going behind enemy lines; not least as the town and region housed the most solidly packed military infrastructure in Europe. 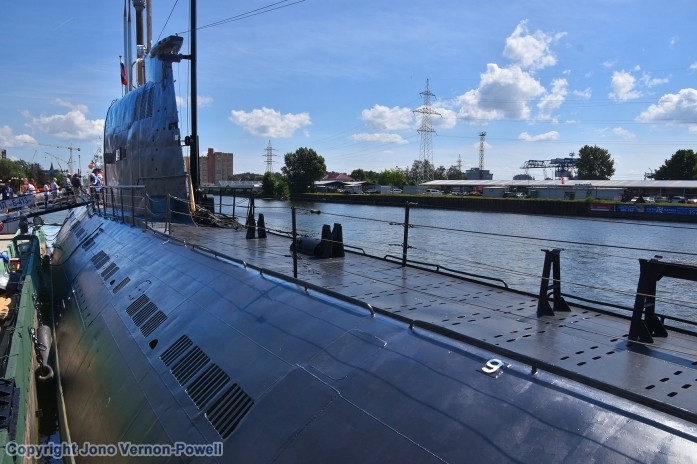 Travelling, forty years on in the spirit of peace, whilst following England playing Belgium in the World Cup at Kaliningrad’s new Oktyabrsky Island stadium, I particularly enjoyed visiting the Submarine B-413 Museum. Permanently located in the heart of old Kaliningrad’s dock area, this hugely impressive submarine stands preserved in her original state, as the only surviving Russian submarine that dates to the pre-atomic era. Viewed from the dockside her smooth cigar-shaped hull and upper flat deck, give no clues to the extraordinary mesh of mechanical genius that lies within. Even if you are fan of the 1990 submarine thriller ‘Hunt for Red October’ (starring Sean Connery) you cannot imagine how old-school and elementary the design and engineering of such a vessel is. Stretching to over 90m in length, with a width of 8.5m, the submarine is split into seven compartments: gigantic torpedo tubes, sailors’ berths, working areas and living compartments, in addition to a constant maze of pipes, gauges, taps, wheels, hatchways, sonar controls, pressure values, twisting tubes, accumulators and all manner of strangely shaped cylinders, hoses and brightly coloured wheels. I found it hot and cramped enough just visiting for a period of an hour. Goodness knows how difficult it would have been living abroad, underwater during one of the submarine’s 90-day-endurance trips. 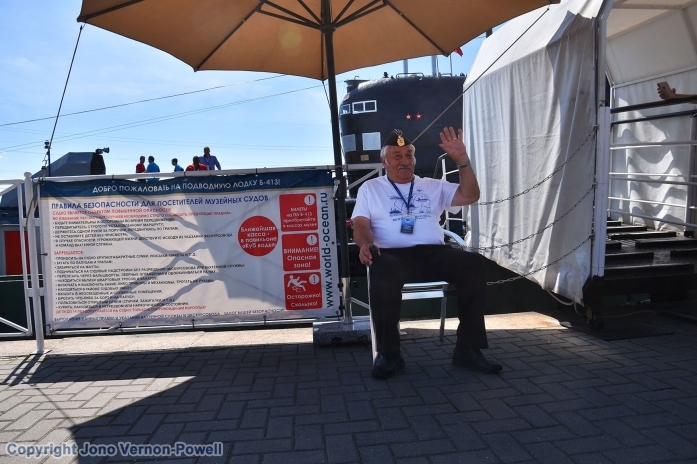 Joined by a group of a dozen or more other visitors, Submarine B-413 was crowded and confined. Rest assured, any visitor will appreciate how a crew of 80 sailed, lived, prepared for war, and dived to depths nearing 400m. With head-banging opportunities everywhere, it would help being just over five-foot two. 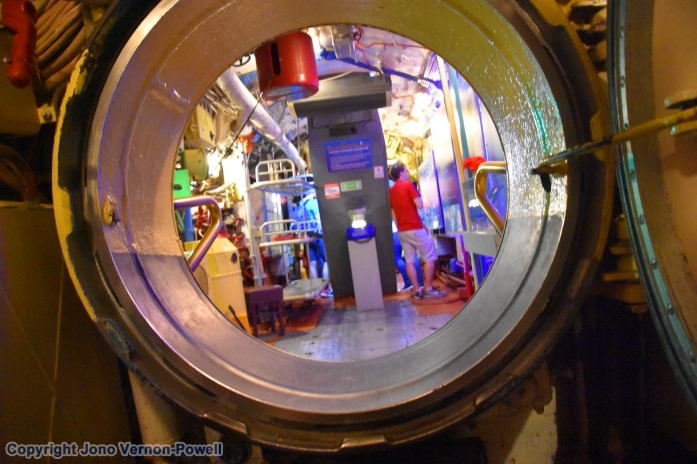 Clambering through, across and in-between the six forward and four stern 533m torpedo tubes, the feeling of being in a giant Macano set is constant. Certainly, my respect for submariners has never been so high. In addition to the access-all-areas B-413, the model of an original barrel submarine highlights how far technology has come on over recent times. A visit gives visitors a ringside view into Kaliningrad’s marine traditions. Which has been home to Russia’s Baltic Fleet since Peter the Great established the Imperial Russian Navy over three hundred years ago (1703).